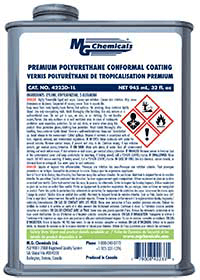 MG Chemicals Polyurethane Conformal Coating is an IPC-CC-830B and UL 94-V0 certified, heat curing, one part product that provides an excellent scratch and chemical resistant finish. The 4223D urethane protects electric circuits against aggressive chemicals, moisture, dirt, dust, thermal shocks, and scratches. It insulates against high-voltage arcing, shorts, and static discharges, allowing for traces to be put closer to one another . Farming, mining, smelting, oil exploration, and marine industries electronics.